The article describes the basic operations that can be done in the Tracker. Choose Tools -> Tracker in the Main Menu to open the Tracker. Click to add a track that will animate some parameter. The Add Parameter window will open. Choose a parameter in the list. 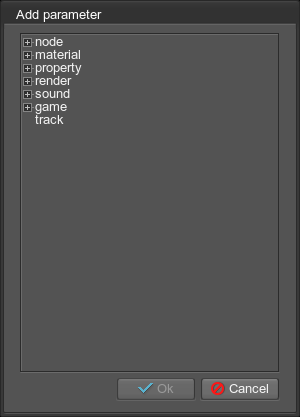 If a track animates some node, material setting or a property parameter, etc., bind this track to it via the Select Node window that opens. Create the required number of key frames by clicking the track line or the graph. Double click the created key frame to set or change its value. Here, you can also set a transition mode for values. Check all available ways of key frame editing. To save a track to a .track file, click Save and specify a track file name in the dialog window that opens. If there are several tracks in the Tracks List, all of them will be saved in a single .track file. To load the previously saved track, click Load and choose the track file in the dialog window that opens. To play animation once, click in the bottom right corner of the Tracker. To play animation in a loop, click . 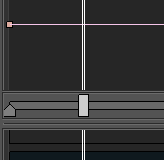 For animation to play, the track with the parameter should be enabled (the should be toggled on). 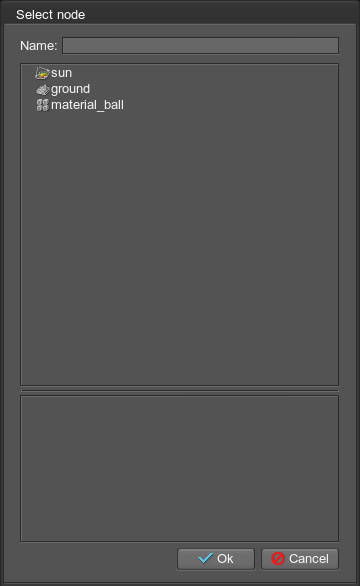 After the track is created, set up the time of animation playback. It would be a common parameter for all tracks in the Tracker. Click to open time settings. Set the playback range that specifies duration of the track playback. Set the From - To range. For example, in the picture below the track will be played only for 0.5 units. Create the required number of key frames and then edit its values by means of the Tracker only. In UnigineEditor, tweak the parameter that is animated and add a new key frame based on it: the value of such key frame will be automatically set to the current value of the parameter. Change the parameter by means of UnigineEditor. 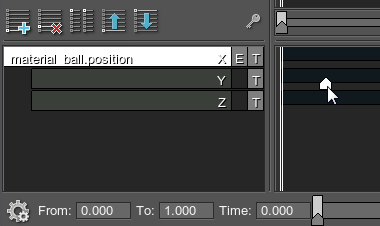 Set the time slider in the position where a key frame should be created. Select the track with the parameter and click . Enable the track again and play the animation. The value of the added key frame can be edited by means of the Tracker. Double-click it and specify the required value in the Value field of the window that opens. Select the key frame and specify the value in the Value field on the upper panel of the Tracker. Move the selected key frame along the track line to increase or decrease the value. If there is a graph for the track, move the target key frame point up to increase the value, or down to decrease it. To select a single key frame, simply click it on the track line or on the graph. It will be highlighted white. Also, you can press and hold Ctrl and select the required key frames one by one. Tracker supports multi-selection editing of key frames: you can select multiple keys and set Time on the track or Value for several parameters simultaneously. To clone the selected key frame (or multiple keys), press and hold Shift while dragging the key frame on the track line or on the graph. 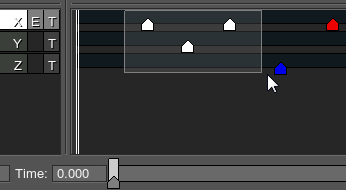 To snap the key frame to key frames on other tracks, hold Alt while moving it along the track line. Snapping mode can also be turned on by pressing on the upper panel. 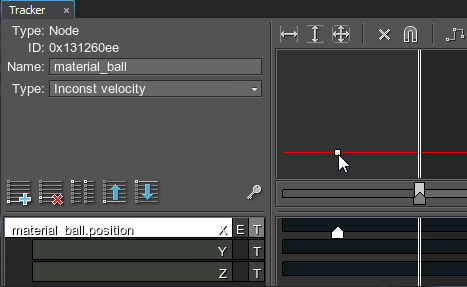 To delete a key frame, select it on the line and drag the mouse upwards. The other ways to delete the key is to click or press Delete. For parameters with values, you can also enable the tracker graph by clicking to the right of the parameter in the tracks list. Simple tracks (like tracks that toggle objects on and off) do not have a graph. The graph allows editing key frames as well as the track line. It also displays the transition mode set for the key frame. To change the graph arrange mode, use the special icons. To move around the graph, hold the middle mouse button while dragging it. To scale the graph, hold the right mouse button while moving the mouse up or down. At that, the tracks list will also be scaled.